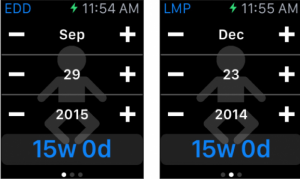 Currently, the OB Wheel Pro 7 app is the only Apple Watch app available that will let you calculate your pregnant patient’s gestational age on your wrist. 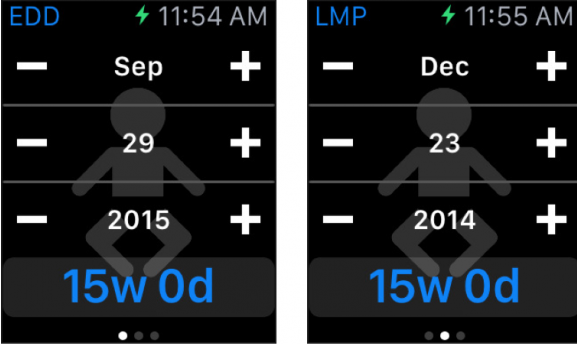 While that’s a nice claim the developers can make, the medical app highlights some key limitations of the Apple Watch. Namely, the inability to input specific numbers. For the OB Wheel app, you have to tap one at a time for specific day of the month — making the app unusable. The stroke app, NIH Score and rt-PA checklist app was able to get away with manual tapping on the Apple Watch because the algorithms don’t require you to enter specific numbers. Another good example is the medical app “Vital Values” — which simply displays 5 cards of data that you can easily swipe through on your Apple Watch. Basically — it’s useless for developers to make medical calculator apps for the Apple Watch since the majority of them require you to enter a specific numerical value. While the OB Wheel Pro 7 app for the Apple Watch is interesting, it’s completely useless on the Apple Watch. Don’t be so negative. The Apple Watch will do fine as an OB Wheel. Developers just need some time to work out the interface. Just look at what is happening in the sphere of calculators for the Apple Watch. Siri would work great and either a pop-up screen or scroll wheel input using the Digital Crown would be worthwhile additions.